The aliens have destroyed our base on Mars, wiped out our space fleets, and now, only one ship stands between Earth and total annihilation! Disgusted by the incompetence of Earth`s military, the independent arms manufacturer Nergal has built its own space battle cruiser. But due to the shortage of trained soldiers, they`ve had to assemble the most unorthodox crew to ever launch into orbit. With a cook who`s also a pilot and an admiral`s daughter in command, the new starship is the most formidable fighting vehicle ever conceived. But before it can see action against the Jovian invaders, the crew must win their first victory against their own species as they fight off a ruthless attempt by Earth`s military to seize the Nadesico! 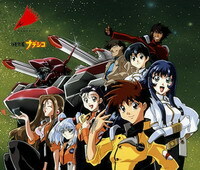 Get ready for the wildest space adventure ever in the amazing new series that was voted the "Best Anime Show Of All Time" by Japanese animation fans, MARTIAN SUCCESSOR NADESICO!